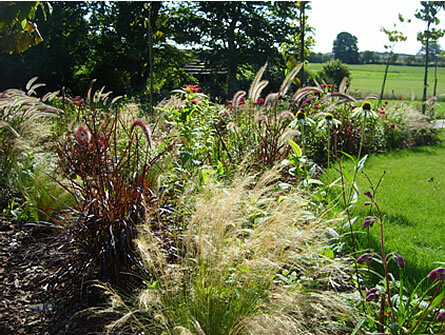 Prairie-style has become the default planting style in many parts of the country perhaps because of its looser, dynamic and flowing effects on the larger garden. For me, prairie-style beds are a great counterpoint to the more static elements of the garden such as hedges, lawn areas and buildings. The great bonus with this type of border is that it takes a rather more gentle glide path to dying back than other kinds of borders and can still look impressive through winter. This border is on thin chalk, north of Winchester. It flanks a 1.2m wide path and is planted around an avenue of young Mulberry trees (Morus nigra). The planting is mirrored on the opposite side of the path. The soil was cleaned (removal of building rubble and large flints) and improved using organic material and well rotted compost. Bonemeal was also added. It was planted up at the end of June and this picture was taken just over two months later on 4th September 2007. It had rained a great deal in the period between planting and taking the picture! The beds will be planted up with daffodils and tulips this autumn, to extend the season of interest.